Interests - Star Wars, Lego, stickers and making cards. Jack developed a limp just after Christmas 2004. We spent weeks taking him to doctors, then to casualty, time and again, before he was admitted. He was diagnosed with irritable hip, arthritis, then a leg infection. It was only weeks later when two lumps appeared in his month, that the Neuroblastoma cells were discovered. Since then Jack has undergone two chemotherapy regimes, which had no effect on the cancer, spread to every bone in his body. He then had highly radioactive iodine therapy, which cleared most of the disease, surgery and then high doses of chemotherapy. We are hoping to raise enough money to take him to New York for antibody treatment. The chances of Jack surviving over a 2 year period are 20%. We believe the treatment in the U.S will increase his chances against the odds which are currently stacked against him. Jack was a magnet for many many people. Those who met him were caught by his force. He was my super Nova, the star that shines brighter than any other but has much too short a life span, so bright it burns out too quickly. It was the love that was poured on Jack that helped the super nova emerge. Thank you to all who showered him with cards, you showered him with love, the water he needed to grow. You helped him grow. Sympathy cards can be sent to the above address and please keep sending cheerful post to Connor and Rhian. A huge thank you for all the cards and letters sent to Connor, Rhian and Jack. Jack will be in the U.S. until March and so we appreciate more than ever the cards sent to Connor and Rhian who are really missing us. Its difficult being away from them, difficult for Jack, and difficult for me, but your cards remind us how lucky we are to be here, still fighting with so much support. Thank you so much. Jack’s scans this week showed multiple relapse. We have very limited options now as his bone marrow is damaged and his blood counts are flat. We’ve had yet another ‘talk’ from hospital and it now seems the sensible thing to do is put Jack onto a ‘holding’ chemo. We are devastated, we truly thought there was a chance he’d beaten this abhorrent disease this time. For now, we’re concentrating on spending quality time together. Personally I’d like to try another trial, something that will prolong Jack’s life but at the same time give him a good quality of life… but all that is left is truly experimental, untried by any child. Jack is tired fighting, his body is exhausted and none of us really want him to go through any further experimental treatment. We have no path right now. Jack has asked if we could take him on holiday somewhere hot and sunny. That’s going to be difficult this time of year but we’re working on it. Thank you for your kindness and support throughout the past few years. Jack’s been back in hospital again – this time with Cystitis and BK virus. The Cystitis proved very painful and had him running to the toilet every 7 minutes (yes, sadly after two days I began timing him). This was day and night, so little sleep was had by any of us. After two weeks the pain seems to finally be abating and the weeing is down to every 20 minutes. A huge thank you to anyone who has sent cards to Jack or to his brother and sister. I am in awe as to how they – his siblings – cope with the constant disruption in their lives. A huge thank you to Sophie P. A parcel addressed to Connor, then to Rhian, then to Jack, arrived all at separate times this week… the only one that had a card inside was Jack’s… from Sophie P. And as they were all packaged the same I’m assuming they’re all from Sophie!! Thank you so so much Sophie. The kids have had a bad week (off school for half term) but with us trying to ‘give back’ to our work (having been absent with Jack for 2 years) taking time off to be with them wasn’t the honourable thing to do, so they’ve been completely bored inside all week with Grandma who has arrived up from Devon. Our children absolutely LOVED receiving something in the post, thank you so very, very much! Making them happy has also made us happy! This week we received the news we have waited so very long to hear – Jack is finally NED (no evidence of disease). Jack has relapsed 4 times with this awful disease and each time it returns, it becomes more aggressive… so we are elated at the news and give thanks wholly to God, and continue to ask for your prayers that Jack has been completely healed. Although NED, he remains on a number of medicines including low dose chemotherapy. His energy is beginning to return, and he is excited at finally being home in the UK, returning to school and a leading a ‘normal’ life. We would very much appreciate some cards being sent this way as throughout his treatment schooling was one of the lesser worries we had, however Jack is behind with reading and maths and we are trying to encourage him in every possible way to read. Your cards would provide a fun and interesting way of helping! Jack had a round of chemo at Great Ormond Street and was due to have a second round but on the day it was due to commence a blood test showed a sudden and dramatic fall in Jack’s Platelets. There had been a two week break following the first cycle of chemotherapy, and during that two week break the blood counts had steadily improved. Our consultant at GOSH could only assume that the cancer was taking hold of Jack’s bone marrow. The chemotherapy could not be proceeded with. We emailed Sloan Kettering where Jack is treated in New York – the High Dose Antibody protocol we had been waiting for had now closed. If we stayed in London, there could be no further treatment unless the blood counts improved. Days later Jack’s blood counts saw another huge drop. We could not afford to sit around waiting any longer. Jack, unable to have the chemotherapy in hospital was back at school and loving it. Outwardly he showed no signs of disease, with the exception of the pallor of his skin. After 3 years of treatment he is the same happy and loving child, as full of life as he was all those long years ago when life was once “normal”. Jack has not tired of the fight. The problem is our doctors appear to have tired of the fight. And that is the conclusion I have reached with Sloan Kettering. In Vermont something has become available which could prove invaluable for many of these children. A resource whereby diseased areas can be biopsied and the sample grown in the laboratory, then tested against numerous agents to establish which is the most effective against the particular strain of disease that child carries. Jack is back in the UK for the moment following the death of his Grandfather. We’ve had a pretty tough year which culminated in intensive treatment throughout November and December, most of which we truly doubted whether Jack would come through in time for Christmas… but the week before Christmas saw our prayers answered and Jack underwent a dramatic turn-around. He got out of hospital just before Christmas, with only one appointment left before the big day. That appointment was one we all dreaded – his scans. They would show us what effect the treatment had had on the cancer growing inside Jack and whether the past weeks of torment had been worth it all, or not. Needless to say, December was a hectic month, where we balanced hospital, work, Jack’s siblings, homework, school panto’s, Christmas presents (which were the last thing we felt like buying)… and the one thing we defaulted on (as there was none available at hospital) – updates and thanks via the internet. Jack received cards every day at hospital, that was his one bright moment of each day for most of his time there and it also gave us (his parents) the courage and the strength to continue fighting, to not give up. Although we have not been able to get back to those who have sent little gifts and cards, this is the best way I can now try and portray our heartfelt gratitude to ALL who cared enough to send a card or little gift to either Jack or his brother and sister, Connor and Rhian – who have had to grow up an awful lot in the past year. For Jack, we are under no illusions. Jack’s scans came back clear – but this is his 4th relapse. His treatment, we are told, is palliative only. This will not prevent us from trying everything we can to prolong his life… even if it means returning to America. Jack has so much energy, so much vitality left, he wants to continue the fight and it is his determination that pushes us on. For 2008, we have much hope and much renewed faith in God. We have much to be grateful for, the support of so many from Post Pals. We were overwhelmed by the wonderful kindness shown to Rhian, to Connor and to Jack by the Christmas Elves. Just before Christmas, while we were in hospital, a friend offered to paint our dining room (which was in an awful state). The internet was disconnected, and that’s how it has stayed until this week. And so our personal thanks have been temporarily put aside in order that we might write this update as a huge thank you to all of you for the amazing support you’ve given to all of us during 2007, and to the unbelievable happiness brought by the Christmas Elves at a very much needed time. Many, many thanks to the Post Pals team for making this all possible, for your continued commitment and dedication to the wonderful job you do! Yvonne, Richard, Connor, Rhian and Jack. Jack has relapsed once again in his bone marrow and possibly in his shoulder and hip so we are back in America for more treatment.We’re supposed to start Beta Glucan with 3F8 next week, this will last two weeks, then we’ll start a 3 week course of High Dose 3F8 antibodies. After that I will be pushing for low dose chemotherapy, there is another trial in a different part of America which we are looking into. Jack recovered quickly in ‘medical’ terms from the pneumonia, but the high fevers continued. He communicated his feelings in his new found word “rotten,” but suffice to say he felt unbelievably poorly, listless, and with no appetite his weight plummeted from 17.9kg to 13kg. A nose tube was inserted and Jack hated it so much he pulled it out inch by inch by himself one evening. His sickness was compounded by the racking cough. Last weekend finally saw a dramatic improvement and from there, a dramatic improvement evolved… the pain stopped and Jack started walking to the toilet with the help of an arm, then later, unaided. Suddenly he wanted to play games again, to colour and draw, and began asking about his new dog, whom he’d seen for only a matter of hours. Later in the week we came home. Our scans are scheduled for Thursday 20th December, at Gt. Ormond St. hospital. Today Jack went to school for a full day. He came home with trousers and shoes covered in mud, complaining of being hungry, despite having eaten a proper school lunch. His face is the same colour as his class mates; it has lost the awful grey pallor and has a rosy tinge on his cheek bones. As each day passes we have more and more hope. For me, blind faith will bring him through this. Thank you all for the amazing support that hasn’t just brought Jack through the uncaring phase, but has shown us indescribable love. I think we have in the region of 500 cards from the US, the UK and some other countries, but this number continues to grow on a daily basis. Yesterday we picked up some packages from UCH, and then collected another 50 cards from our local hospital. Each card holds a special message; many of you continue to pray for Jack. Is it the prayer? Is it the positive thoughts? Whatever it is, please keep doing it – it is working. This was one of those weeks. Jack had begun feeling better towards the end of last week and asking to go to school. Then throughout the night on Friday, Jack developed a fever resulting in him being admitted to Barnet General early on Saturday morning. We hoped that it would be diagnosed as ‘viral’ as a flu bug has been sweeping through Barnet, but he was admitted to Treasure Island ward. Our bitter disappointment was evident as we tried to explain it was Jack’s last weekend of freedom – once the second course of MIBG therapy hit him, his counts would worsen and it was probable he wouldn’t be out of hospital much before Christmas again. He had missed the school fireworks because he’d been in-patient at UCH and we had arranged with friends to have our own fireworks party at home that night. The hospital staff were fantastic. They worked the antibiotics so that Jack was allowed out for a few hours that evening. Jack watched the fireworks for a while but despite being wrapped up in a jumper and coat he began to feel the cold, the anti-sickness drugs were wearing off and tiredness set in. He finally gave in and watched the fun from inside the kitchen window before falling asleep. On Monday afternoon after blood transfusions and more platelets, we were transferred back down to UCH. An awful cough had developed, it was very persistent and reminiscent of the cough he had last December when he had pneumonia. How he managed to lie still for the 2 hr MIBG scan the following morning, I have no idea. A second chest X-ray was taken following the scan, this showed something going on in his chest, no one knew what it was, it could be infection or it could be further disease. I spent the day in turmoil, apprehensive and scared that this hated disease had advanced into his lungs, this is one of the worst things that could happen. The hardest areas from which to clear the disease are the lungs and liver. By Wednesday, common sense became the basis of renewed hope, the fever had gone and the cough had developed so suddenly; this had to be an infection, but still the unease persisted. On Wednesday the decision was made to proceed with the second dose of MIBG – even if this was new disease, we had nothing else, chemo wouldn’t clear the disease and our hope lay ultimately in the MIBG. So at 2pm the second infusion was conducted, 24 hours later than scheduled. Jack lay throughout the day listless with no energy looking frailer than we’ve ever seen him look before. He has had no appetite for days. He is rapidly losing weight and it showed in his skeletal frame, his eyes have lost their sparkle, his skin is an awful grey colour and black circles are prominent underneath. However, his moment of happiness has not been deprived to him… that moment being when ‘the postman’ arrives. More than ever we now appreciate the cards that are still arriving. In an effort to keep that sought after smile, we have taken to ‘drip feeding’ him the cards. A few in the morning after breakfast, a few more at lunchtime and few more in the afternoon. It is the little things in life that give the most pleasure. Those cards mean much more to us than most could realise. They keep us – his parents – alive too. Finally it remains to say a huge thank you yet again, to the many who have sent cards and letters and magazines. To the many schools that have sent us bundles of pictures and books. Every single card has made a huge difference. It was strange, odd on certain levels, re-entering University College Hospital. Two years ago to the very day we had placed ourselves in the same scene. Two years ago following 12 rounds of unsuccessful chemotherapy Jack surrendered to MIBG radioactive therapy. Then there was a sense of trepidation, now there is a sense of trepidation. But its cause is subtly different. Jack coped well; he coloured and we looked at books; played Uno; watched TV and annoyed each other. The food was tolerated and Jack’s only symptom of processes within was the early onset of diarrhoea. Jack got cards AND more cards and AND more cards – it was great fun reading out the messages and working out how best arrange their display. Thank you to everyone who sent them in – I wish there were words to describe how much they are appreciated. The broke the boredom, the monotony, and towards the end of the week when Jack became sickly and lethargic, wanting only to lie in bed, his one bright moment was the arrival of ‘the postman’. I hope it is suffice to say that each card he received will provide us with a very precious memory; we intend to keep every single one. Thank you. Jack’s radiation count came down steadily and by Saturday afternoon he was considered to be ‘cool’ enough for contact with the outside world. Our escape was made more memorable by one of those lovely notes employees of Camden leave on the windscreen of your car. Jack has suffered further sickness and his appetite is negligible. We hope he will find some energy before Monday’s return to hospital for more MIGB. We took Jack to Great Ormond Street Hospital on Tuesday, the only suggestion forthcoming was radiation to the sites of the new tumours and maintenance low dose chemo. Jack has never responded well to Chemotherapy, and the likelihood is that we would use his final bag of stem cells, with little response, it therefore seemed sensible to enquire about further Mibg therapy – although it’s highly toxic, this worked two years ago, the back lash of the toxicity in future years was something we no longer have to think about. Jack will be admitted on Monday 29th October. The radioactive Isotope will be injected on Tuesday 30th and he will remain in Isolation until at least Saturday. There will be a one week break before being repeated in two weeks time. Our hope is that we will be able to give Jack, Connor and Rhian one last wonderful Christmas together. We are under no illusions, every day is precious. We are very grateful for your prayers, and would welcome any letters or cards you wish to send Jack during his weeks of isolation. We are still considering the way ahead for Jack. We are most likely to undertake further mibg therapy at UCH london, commencing Monday 29th October. This is something we never imagined Jack would have to undergo again, involving further radioactive infusions and two weeks of isolation as Jack will become radioactive after each infusion. A week has gone by since our return to the UK, and we are beginning to feel some of Jack’s fighting spirit ebb our way, although we are realistic enough to accept we are merely buying time with whatever course of action we take. The simple fact is this, Jack has a particularly aggressive type of disease, one that never reacted to chemotherapy in any way. There is much work being conducted in many, many institutes across America and we have no doubt a cure is within reach. Whether it will be found in time for Jack is doubtful. Either way fundraising is essential, we will continue to fundraise to speed the way to finding the cure, and bring it to the UK. We had a heavy day of scans on Friday, and have been devastated by the result of the Mibg Scans. Jack has relapsed in multiple spots, left leg, right leg, knees, thighs, pelvis, hip and right shoulder. Friday was terribly difficult for him, we’d had little sleep the night before, and he’d been up at 6.30am to drink contrast fluids. Scan after long scan became more and more tedious, he is still frightened of the large machines, especially the noisy ones, and finishing off the final scans and the bone marrows, having seen the screen of the Mibg monitor was utter torture. I have brought him home. For now, he is in the one place he wants to be – in his home which he hasn’t seen for nearly 11 months, and with his family. The one question that arises now is what to do. His blood counts are low and will not tolerate High Dose chemotherapy, he’s used up most other options. Quality of life for Jack must now take precedence over everything else. He has fought ‘the good fight’, but this awful disease still prevails. Jack continues to under go extremely painful treatment. The antibody therapy attacks the molecules found on Neuroblastoma cells, sadly it is also found on nerves so it causes very intense pain. Jack has finally received the first dose of 8H9, the treatment we came to the US for 6 months ago! It’s been a long and hard road, but we’ve felt such a sense of relief that he has finally received this one thing that gives us much hope. He’s been having headaches non-stop since the injection 2 weeks ago, so further scans were conducted today, with one final one tomorrow. Hopefully they will show only something good and we can proceed with the second and final dose next week. Jack is completely fed up with treatment, and now his siblings have broken up at school it’s even harder getting him to hospital in the mornings. We’re focusing on his 6th birthday this weekend- a milestone which at one point we never thought we’d reach – and the possibility of going home soon. A huge thank you to the many of you that gave us much support during the early part of this year. We have found out that despite chemotherapy Jack has relapsed in his bone and bone marrow and this is very bad news for us all. Despite the risks, we have decided to start stronger chemotherapy as it gives Jack the best chance. We want to say a huge thank you for the lovely cards, pictures, photo’s that have been sent to Jack. We are so sorry we don’t seem to find time to write thanks back, our life is one big rush at the moment. Jack seems to come back from hospital just at the same time Connor and Rhian need to be picked up from school… the parcels have just arrived at that point and there is a HUGE rush to the Ronald McDonald reception by our 3 children – from all directions. We have received some beautiful packages over the past 6 weeks and we are humbled that you take the time and make the effort to do this… be in no doubt, if you saw and heard our children, you would know how very very worthwhile this is (I was a cynic about 2 years ago…) Anyway, we’ve now devised some thank you cards, and if I can get to the return addresses first… I’ll ensure the JBA THOMAS TANK cards are forthcoming. A huge thanks, once again, for the mail that has been arriving. Every day Jack goes down to check our mailbox (on return from hospital), picks out his own mail and leaves ours behind… he’s had a tough week again with more surgery, and despite pressure pads his head is beginning to swell again – somehow I get the impression surgery is not over! He received several packets of lovely little gifts, which he shares with his sister. A huge thank you, these little things make him so happy, and we appreciate the thoughts and the effort you take to prepare these so much. I wish I could tell how valuable they are… they keep Jack going! Lots of love from all of us (Richard, Yvonne, Rhian, Connor and Jack). Jack has had a relatively tough weekend. His fevers continued to reach 40 degrees. He still had pain despite pain relief, but worst of all was his coughing, a convulsing harsh cough that would rack his body and leave him gasping for breath in between coughs, until a nebulizer was put against his mouth giving him oxygen with medication combined, which helped to open his lungs and airways. Shortly later it would start again. On Monday the fever subsided and the pain lessened and by Wednesday Jack was up and out of bed in search of Hot Wheels. His cough remained but the high temperatures had gone, although he remained steadfast in his refusals to eat. His radiotherapy continued relentlessly, day after day, despite his unwillingness to lie face down in the mould in which his swollen head still would not fit. And it would take much, much longer for the radiotherapy team to link the laser lines against the small dots tattooed over his head and along his body. And throughout, Jack’s crying and coughing would upset the exact and precise nature of the treatment. On Thursday, Jack was discharged to the Ronald McDonald House, although still to continue 6 hourly antibiotics intravenously. Jack was ecstatic to be back at the RmcD House, his appetite returned as did his energy, it wasn’t long before he was running around the House (with a mask, as his cough remained). Rhian and Connor had finally started school, in the same street as Sloan Kettering. Friday saw the last of the long radiotherapy sessions. From Monday, the smaller ‘booster’ sessions would begin, and would focus on his head only. There would still be alignment sessions to conduct, but these no longer had to be aligned with his spine. The swelling in Jack’s head has gone down considerably, although pockets of fluids have manifested around his scar and on the top of his head. Tonight Jack had the hated injection of GMCSF in his leg… it’s very, very sore, not just from the pierce, but the thick liquid going in… so afterwards, we put our hand in the box from Post Pals and brought out this BIG LOLLIPOP OF SPONGEBOB… guess who was on TV at the same time? Well, that really did the trick, so thank you so much!!! Here is a picture of a Princess Pop, Car Pop and Spongebob Pop sent to Jack, Rhian and Connor. The neurology doctors came round and after examining Jack, they decided to take a sample of the fluids from his head. These would be tested in the same manner as the blood cultures – to see if they grew any bacteria – to establish whether Jack’s head had become infected. This was extremely unpleasant; a needle was inserted into Jack’s forehead without any numbing, and a full syringe of fluids was drawn out. The second significant thing was found as a result of the chest X-ray. It appeared Jack had some lung filtrations, on both lungs. This is usually associated with pneumonia. Tomorrow he will have a further MRI of his head which should help give an early indication as to whether he has an infection in the surgery site. Further tests will be conducted on the suspected pneumonia. He has already been placed on new antibiotics to combat the pneumonia. A huge thank you to everyone who made Jack’s Christmas very special with lots of cards and little parcels to open. THANK YOU SO MUCH… one happy boy is a big happy family! Through Post Pals, a lovely lady called Susannah contacted me, she has been sending things to Jack and at Christmas, she and her friends sent some home made jewellery and Christmas ornaments to me. That was a fantastic gift, it had all been hand done, and it made me feel so SPECIAL! After radiotherapy on Friday, we took the children out for some air. In the late afternoon we noticed the fluids in Jack’s head had built up even more; his forehead above his left eye bulged with fluids and felt like a huge blister to touch. He had been in the stroller all day, but had no energy. I wanted to take him back to hospital then and there, but common sense reminded us the consultants were not perturbed by the fluids and assured us the CT scan was normal. Over the weekend the swelling went down slightly. Things remained much the same for Jack, he would sporadically tell us he had a sore head, but so far we had not given him any pain relief. And he had been going to sleep much earlier. What really perturbed me was the fact he was no longer playing with his friends. After tea he would want to be cuddled in bed, or play quietly in the room. This was very unlike Jack but we knew Justin, who had just gone home, had also been knocked out by radiotherapy so once again we put his tiredness down to this. We had been warned a side effect of chemotherapy was diarrhoea and this was finally kicking in so, again, it was probably due to everything his body was going through. On Saturday 16th Jack’s face was swollen and his right eye was completely shut. His matted hair revealed the 42 stitches shaped as a question mark stretching from the front centre of his skull to the left ear lobe. But having had morphine at midnight Jack declared himself ‘fine’. And he was; he ate, ate lots, walked a little and played; and talked and ate and in the late afternoon the doctors declared Jack well enough to come home. So the surgery had gone well, Jack had responded well and now in advance of our expectations he was returning to the house. This was great news not just in the obvious sense but even in smaller ways, such as Rhian having to wait in corridors, she being too young to enter the ward and visit her brother. At 6am on Sunday morning, Jack woke up crying out in pain from his head; he immediately started shaking, harder than before and for longer. We gave the other children breakfast before beginning to try and encourage him to get out of bed and get dressed. We had already decided to take him to the Urgent Care Unit at Sloane, but didn’t want to tell him immediately as we anticipated protests – especially now his brother and sister were here. However he was extremely placid about it, and accepted it without question. During the morning attack he had told me he was very scared of something, but refused to tell me what. No amount of coaxing could get him to part with whatever it was he had envisaged. That evening Jack was admitted. The CT scan showed the tumour had increased in size and was now surrounded by fluids and possibly blood. If the tumour was bleeding this was not good news. We received some results today… and I guess in this situation, they’ve got to be good. The Mibg scan does not detect any Neuroblastoma cells throughout the rest of Jack’s body. This is somewhat reassuring, but the doctors did emphasize this doesn’t mean there aren’t some there, i.e. they’re just not big enough for the scan to detect yet (the reason we were having antibodies in the first instance). Secondly, the spinal MRI scan shows Jack’s Spine is clear. However the MRI scan of the brain indicates the tumour is in the centre of the brain and not the lining. The neurologist had told us to hope it was on the lining, as this was easier to deal with. However our consultant (expert in the disease, but not in the brain…) told us it was best case scenario to be in the middle of the brain, as if it were on the bone or the lining, this would only mean there were NB cells elsewhere, as it would have had to have been carried to these areas. This is definitely not one for me to figure out; I’m leaving things to God. But it appears our prayers were listened to. So a plan of action has been formed. Jack will have surgery sometime this week (a date has not been provided by the neurosurgeon yet). If successful, an Ommaya reservoir will be placed in his head (this is a conduit to put medicines into his brain directly). Jack will then be put onto Ironatecan, a chemotherapy drug to be given intravenously each day. He will then have cranio-spinal irradiation (CSI) (radiation, but given to his spine and his brain). Next comes Intra-thecal (IT) radioabled antibody (3F8 or 8H9) – this will be one of the hot antibodies (with radioactive iodine) given through the reservoir in his head and fed directly into the brain. The intention is after removal of the tumour, the radioactive iodine attached to the antibodies will be sufficient to kill any NB cells inside his brain. After this, he will resume the 3F8 antibodies with GMCSF which he has been having until now. Obviously we will be praying nearer the time (if he makes it that far), that he does not HAMA in meantime. But this is way down the line. And finally he will start Temozolomide by mouth. This whole procedure will take minimum of two years starting from surgery. I take great hope from the ‘2 year bit’. However, I have seen the doctors happier than I have today, but it’s not a pleasant situation, so we’ll give it our best shot. For the next 3 or 4 months Richard and I will stay with Jack, and bring the other kids over. After this time period, Jack may be allowed home for 2 weeks at a time. That’s the plan, nothing formalised yet, but what the doctors have told us today. At least we now have hope. This week they have found a brain tumour. Jack’s severe head pains started on Sunday and he has had tests in the last couple of days. This news has sent us reeling in shock. Jack has now completed round 4 of antibodies at MSKCC. The treatment is now condensed into 1 week and he has found it terribly painful. Apart from pain, the other hugely inhibiting factor is sleep. Probably due to the morphine, he sleeps until well into the evening which means he has not been able to play so much with his new American friends. Upon our return to the UK we both found it so much harder to deal with jet lag this time, I guess this is because the ‘time switches’ were so close. We’re not sure if we’re returning to MSKCC or not. One doctor has told us we should return December 4th, but another says we shouldn’t. A blood test should confirm this in the coming week. Jack has just completed his 3rd cycle of antibody therapy, arriving back a 5.55am this morning, tired but excited at the prospect of seeing Connor and Rhian again. His hair is beginning to get long, but we can’t stand the thought of cutting it just yet. With elongated chemotherapy, he’s been without hair for so long, that it now seems odd to have it back. He received 4 or 5 cars from Susanna in US while he was in New York, (through Post Pals) and this made him so very happy! Thanks Susanna, and thanks Post Pals. We wanted to say a big thank you especially to Julie and Alan Barrett who have sent on a number of occasions, not just beautiful cards but gifts too. I’m embarrassed to say that their address is still by my computer waiting for me to get time to write a thank you. We are currently in New York where Jack is continuing treatment, and therefore I would be grateful if you could pass our huge thanks to them, and to anyone else who has posted a card or letter to Jack. Thank you also to Post Pals. Yesterday we received some disappointing news from the hospital in America. The blood sent for testing demonstrates Jack producing HAMA, (Human Anti Mouse Antibody). This occurs when a patient’s immune system fights the antibody, which the hospital has infused. A consequence of this is that Jack cannot go to New York on the 2nd July as his body would try and reject the next round of treatment. We are left having to repeat blood tests in another 2 weeks in order to determine whether we can then go, and has left us with some questions about what to do in the mean time treatment wise. Jack began radiotherapy on the 12th at the Middlesex hospital. 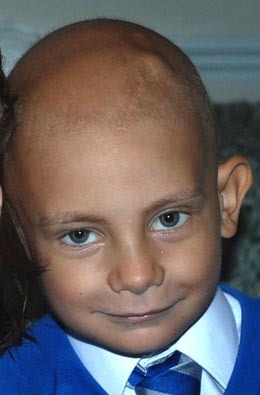 Jack has been able to attend mornings at school before the radiotherapy, this will continue until the 29th June. It has progressed without too many dramas; some pain and sickness but by and large Jack has managed the process quite well. Yvonne and Jack, subject to the results of a blood test, return to New York on the 2nd July 2006, when the next round of antibody therapy should be completed. We returned to the UK today, we are due to fly back out to America on the 2nd of July. Jack is now in America thanks to people raising funds. He will remain there until July as he has to undergo radiation. His post sent to the above address will be taken out to him every 2 weeks but please don’t send any bulky items.